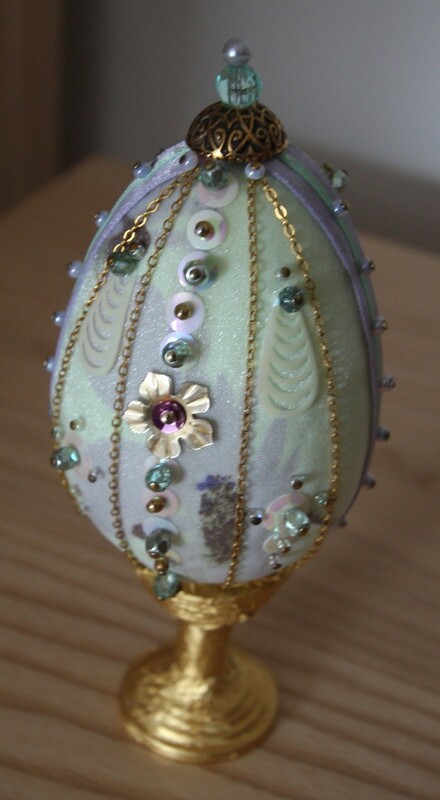 The monthly competition one month at Essex Handicrafts Association was an Easter Egg. I bought this cheap polystyrene egg at a pound shop: it was covered in pale green organza and had some dreadful decorations, which I removed. Just used beads, ribbons and sequins that I had on hand to decorate: don't know what the base was, but it was plastic so I covered it with chocolate foil (before I had any gold leaf!). Very pretty, did you win? No, Di - not even in the top three! Lovely up-cycle. should have come top. Well that had humble beginnings but it loos fab now, great job. Nearest I'll ever get, Ruth! Very pretty, must get mine finished.